This new handheld MR HH425LI VHF from Cobra looks very interesting especially if you live in North America or Canada and need to use GMRS as well as a marine VHF. GMRS and FRS are for personal and family use in the USA and Canada. FRS is normally a 0.5W transmission by the way, and requires no FCC license – but this unit will require a license because it is capable of transmitting up to 5W. The unit can also record your own transmission out if you want it to and this appears to be held in a separate memory to the inbound recording – well done Cobra for a simple and effective enhancement. The only problem is that it does not do DSC – this is an oversight for the European market. If you are in Europe and you want the Rewind feature and you want DSC then Cobra only offer the fixed mounted radios such as the MR F80B. Ok, who will produce the first handheld with VHF/GMRS/DSC and Rewind ? Russ October 8th, 2007| One comment so far - be the next!|Tags: DSC - Electronics. After a recent correspondence via this blog, I thought it would be useful to publish the interface information for this connection. If you have done any research you will have realised by now that the NMEA protocol is really a very poorly implemented “standard” . What you have discovered about the wiring carries on into the programming of the chips that send the data. 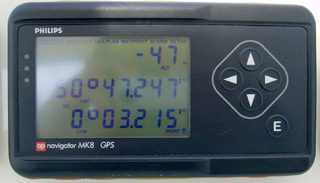 This standard is the NMEA 0183 protocol – now replaced by NMEA 2000 – which is also badly implemented. Just in case you are asking why – it is because manufacturers have used this confusion to protect market share and make their equipment incompatible on purpose. NMEA 0183 version 2.0 sentences for GPS all start with $GP and then a 3 letter acronym. So you can see that when the MT-500 DSC manual says $GPRMC / GGA they mean that the two sentences above must be being sent by the Phillips MK8. It will transmit RMC (Time, date, position, course, and speed data) every 2 seconds. BUT it will also transmit GGA – Global Positioning System Fix data (Time, position, fix) if you have the MK8 with differential software. This was issued as a software upgrade after the MK8 started shipping. Russ January 31st, 2007| 5 comments - be the next!|Tags: DSC - Electronics - NMEA - Philips MK8.